Nya-tan is a cute character. It's still early to describe about the other characters in the story. I love the explanations of the confusing parts as well as the use of asides to point out certain facts without completely breaking the fourth wall. The animation and use of color is well done. Im not a huge fan of chibi within the story (i.e. Gugure! Kokkuri-san & Tenkai Knights to name a few) however the chibi are very cute. I can't wait to see how the plot progresses, especially since I have avoided the manga until now. Generic and cliche. Nothing to see here. 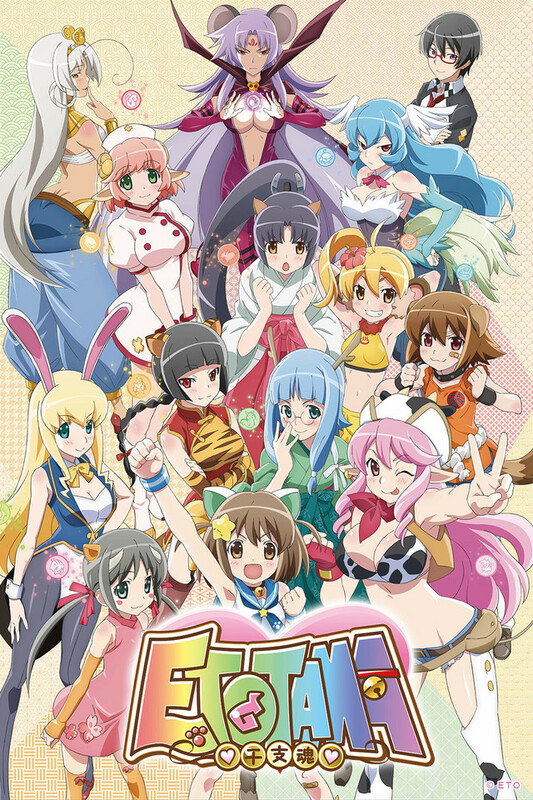 I'm sure this type of anime appeals to a lot of people, and I happen to even like cutesy fluffy stuff but this is just another typical harem anime. 7 minutes in and he's already walked in on her in the bath. Of course. The girls are all super cliche, no wonder guys who watch anime think so little of women! I'm not sure what I was expecting when I clicked on this but.... Definitely go into this understanding this is for the type who like harem, if you don't like harem, you probably won't like this. Harem liker folks... don't you get tired of the same thing all the time? This show clearly deserves three stars but I am giving it 2 bonus stars for uber-weirdness above and beyond the call of duty. Does it have a plot? Characters? Who can say? So, basically, if I get it right, this is Ah, Megami-Sama with cat girls? (and dragon girls, and ox girls...) And the boy has to give them props so they can power up? Oh, and it's also an educational show that teaches you to recite the Chinese zodiac in order? I'm going to go watch the end of the show now. Insert smiley face here-->. PS--After watching the conclusion of ep 1 I have decided this show deserves 4 stars...plus the bonus star for being totally freaky. Also I am in love with Dora-tan. Is there a Dora-tan doujinshi out yet? Eto Rangers + Moe?! Yes please. Title sums it up pretty nicely. If you like harems, this is basically just another fun show to romp through. I'd recommend it to anybody who doesn't need a lot of development/deep content/etc to have a fun time. It's got some weird CGI fight scenes that I weren't expecting, those took me a while to get used to. But after I did, I've learned to look forward to them. So, in short, I'm giving this a 5 because it's exactly what I want in a cartoon of its type. Warning: This review is based on the first 5 episodes only. Another eto inspired anime came out (the last one I watched was Twelve Warrior Explosive Eto Rangers), which almost always made me interested. Before I could learn about the story, I could check the characters. Good arts and cute characters, but the character design is cliched and stereotyped (excepted Chicken, whose color is seldom used for chickens). The cat even made me think of Kyōran Kazoku Nikki. Still, this was fine. Finally, the show came out, and I started watching it. The first episode has the goddesses asking the man eto, and that lasts for several minutes, without any funny element nor progress in the story. Part of the first episode is the goddesses reciting the 12 earthly branches, which again lasts several minutes without adding comedy nor progress to the story. The battle is okay, but given that its context is unclear, so is the battle's meaning unclear. The story is poor, but some non-for-kids elements might compensate for that. Nevertheless, not until the fifth episode, which has a few moments for those who like H elements, there isn't much non-for-kids elements. I'd like to give only one star for this show for now. I probably will not continue watching it, though. Several weeks after writing the above review, I checked this anime again, including the episodes I had watched. I also read other reviews on and outside this website to learn what people think are good about it. Among the good mentioned is the 3D fight scenes. This anime indeed has good 3D fight scenes - smooth and full of actions, and the background is developed well. As previously mentioned, I think the story is poor. There is little plot going on, which is not always bad for a comedy. Still, the comedy elements in this anime, a few of which are interesting, are too mild in my opinion. I might have laughed throughout the season if I were still young, when these comedy points were still fresh, but this is not the case. I am not into moe or GL (although I don't hate them), so they do not weigh much in my review. I must say that this is completely adorable, I like the story behind it. It's a lot of fun to watch, definitely screws with emotions in the first couple episodes, then you realize it's not entirely serious. If anything, it's one of the least serious anime's that actually follows a story since I watched Bobobo, keep in mind I don't watch very much anime.